July 2016 - Pebbles, Inc.
Hello Pebbles friends, Becki here. 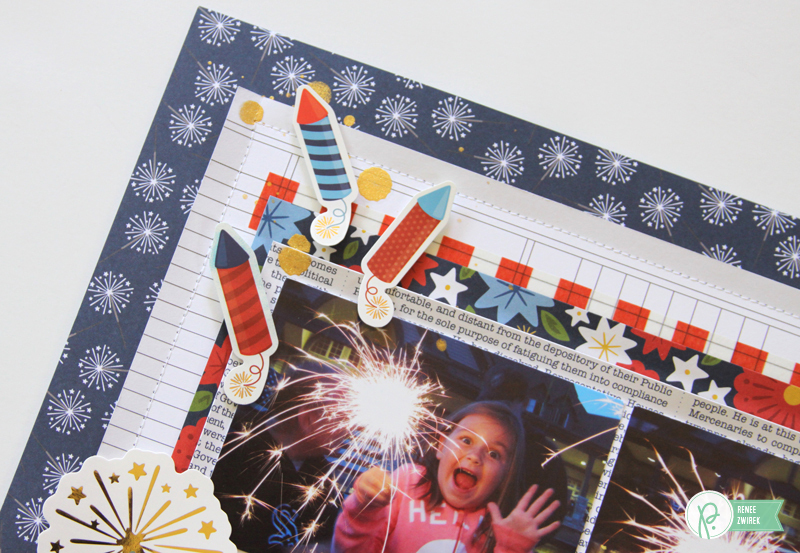 I’m excited to share a Fourth of July layout with you. 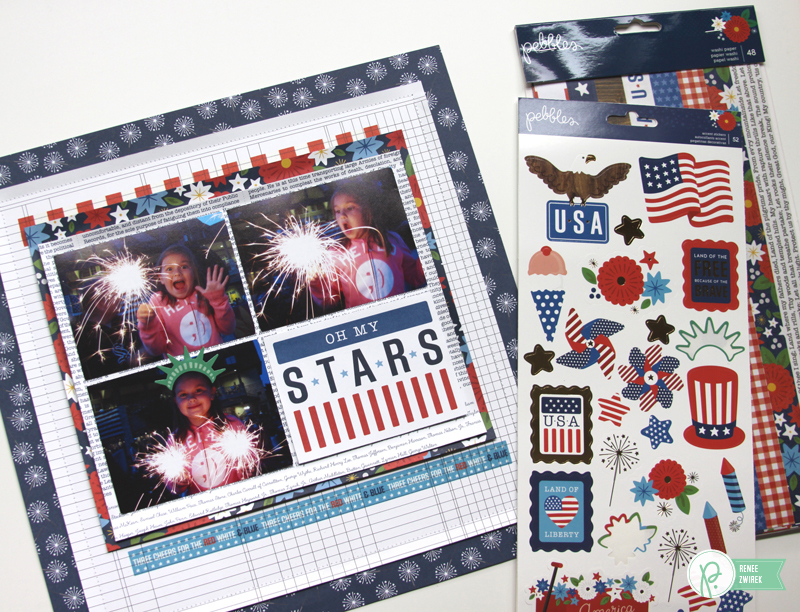 The fourth of July isn’t a holiday that I typically scrapbook. The new America the Beautiful collection changed that. 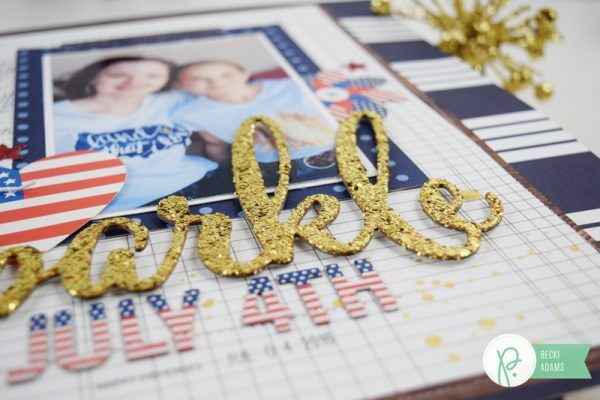 I couldn’t resist playing with this collection and pairing it with the adorable glittery “sparkle” title from the Jen Hadfield DIY Home collection. I’ve been hoarding saving these words for the perfect project. 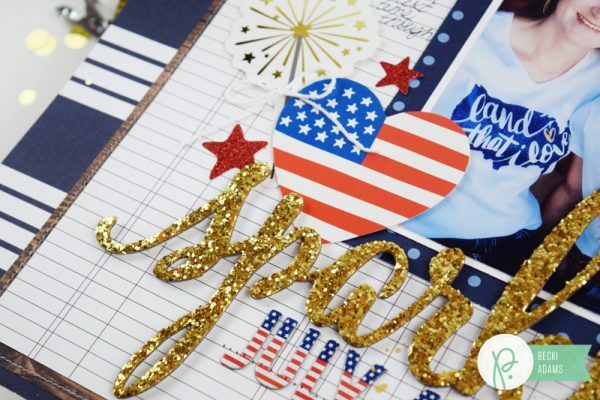 Isn’t the word “sparkle” perfect for a Fourth of July layout? I started by gathering a few supplies to accompany my “sparkle” title. I wanted the traditional red, white, and blue color scheme with a big pop of gold and a little bit of woodgrain to make a border. I have to say, I love how this layout turned out. 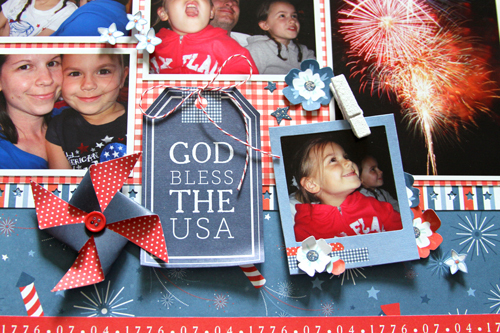 I’m so glad I took the time to take photos and create a Fourth of July layout. Below the “sparkle” titled I added “July 4th” in Thickers. 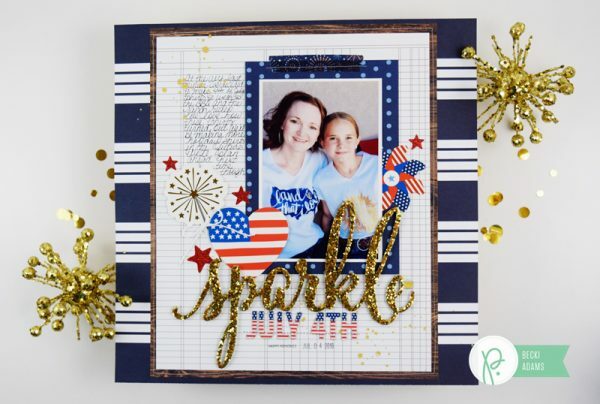 Although the layout is titled “sparkle” I wanted the Fourth of July to be on the layout as well. I stitched the “July 4th” Thickers with my sewing machine. Stitching over Thickers not only keeps them in place but it adds a little bit of texture as well. I adhered the “sparkle” die cut with adhesive foam squares. I wanted it to pop off the layout. It also made it easier to tuck my photo and a few other die cuts under it. I finished the layout by adding some red glitter star stickers. 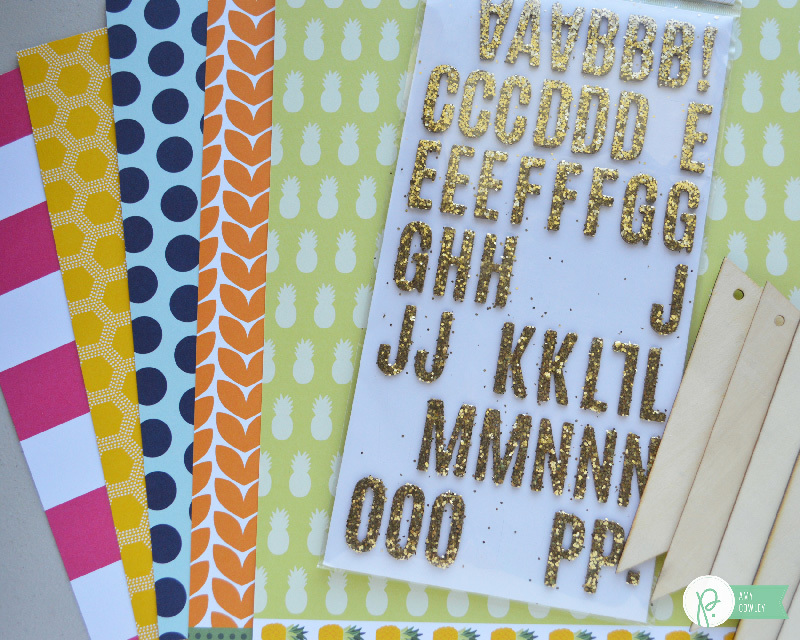 They add some more sparkle to the layout (you can never have too much glittery sparkle, right?). My handwritten journaling was the finishing touch to this layout. I love the personal touch that handwriting gives to my layouts. 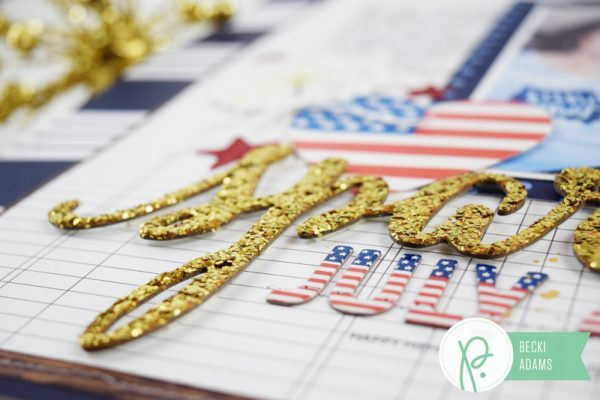 Do you have the America the Beautiful collection on your desk? If not, you need to get it. 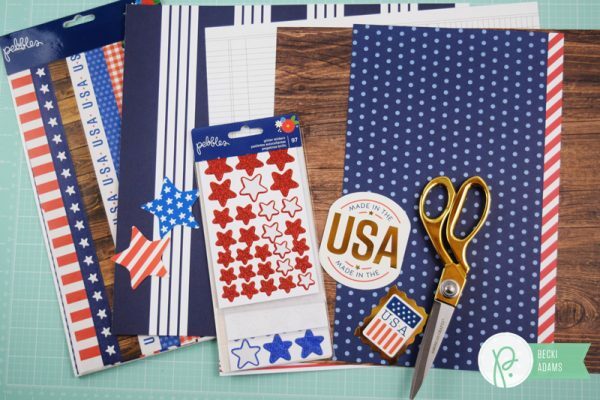 It’s perfect for creating Fourth of July layouts. Thanks for stopping by the Pebbles blog today. I’ll see you again soon! 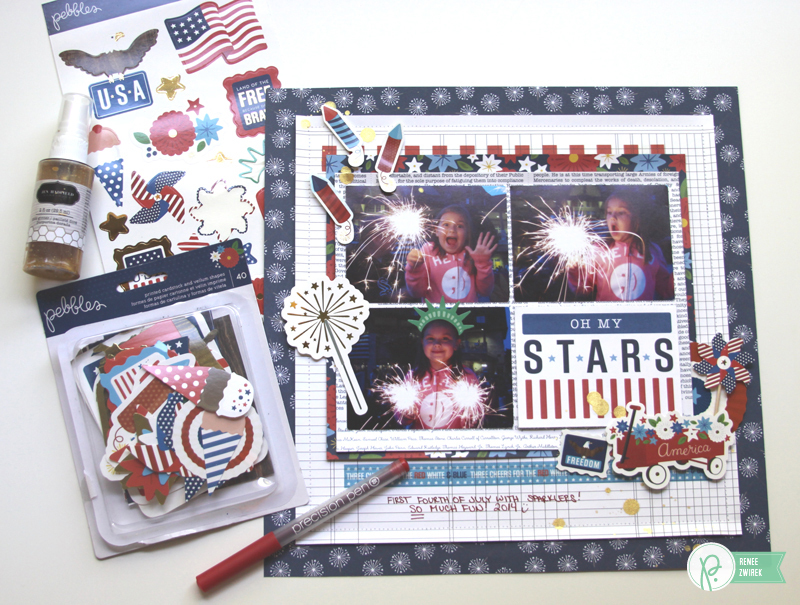 Hi, Renee here to share a fun Oh My Stars layout I made using the America the Beautiful collection. I couldn’t resist scrapping these favorite 4th of July pics of Payton with sparklers. 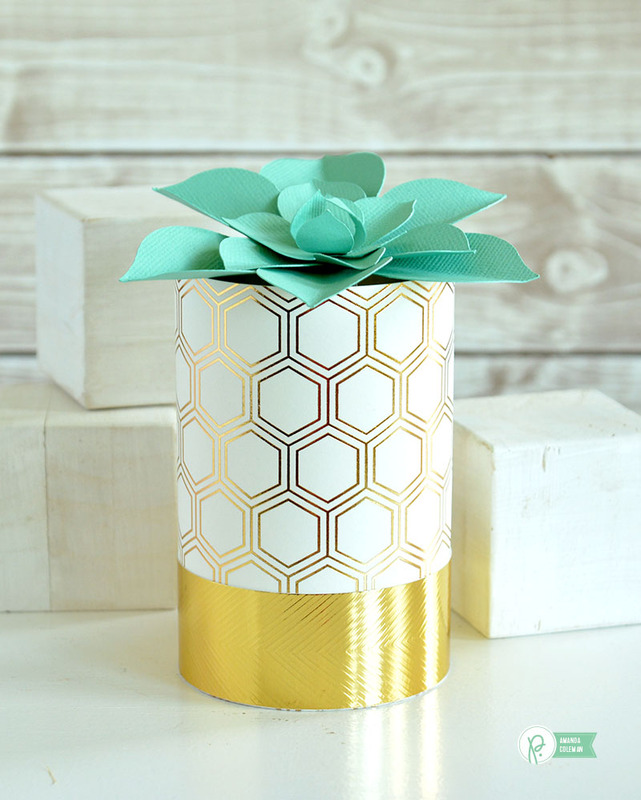 When I saw the Sparklers pattern paper in this collection, I knew I had to use it here. So, I used it for my background paper. 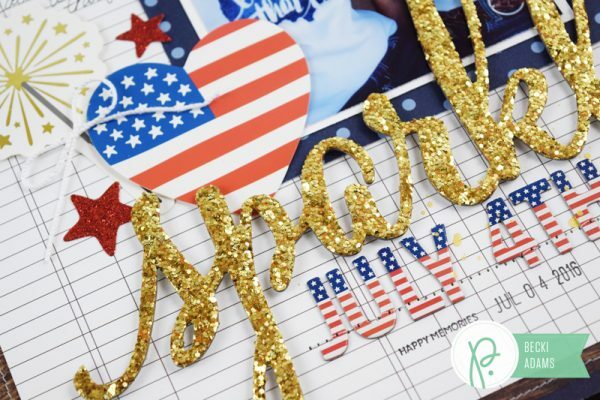 I trimmed the Happy 4th of July pattern paper to 10 ½” x 10 ½”, adhered it to my Sparklers background paper, and added machine stitching all around. 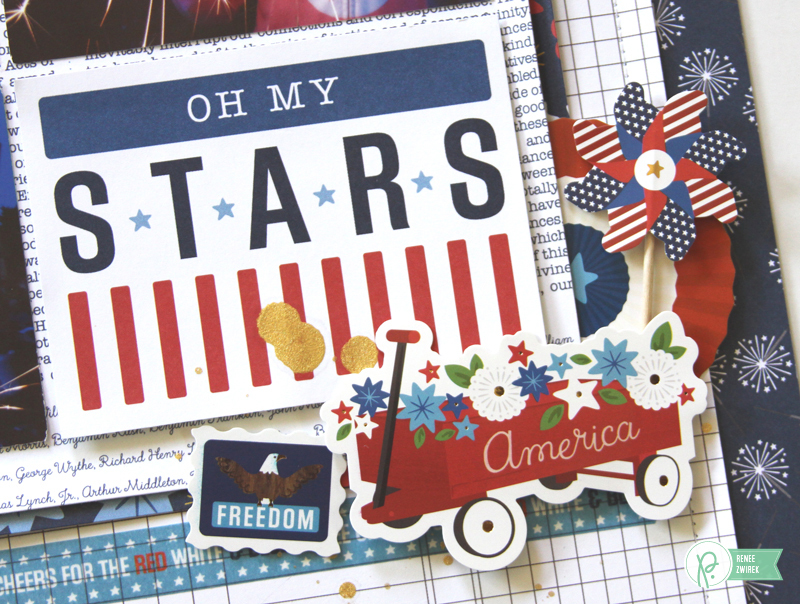 I chose my favorite three photos and trimmed them down to 3″ x 4″ to match the size of the Oh My Stars 3″ x 4″ card. I adhered my photos and title card to a 6 7/8″ x 8 ½” piece of the Declaration pattern paper. Then, I trimmed the Patriotic Posies pattern paper down to 7 ½” x 9″ and added that underneath for my layers. I added my layers to the background papers. 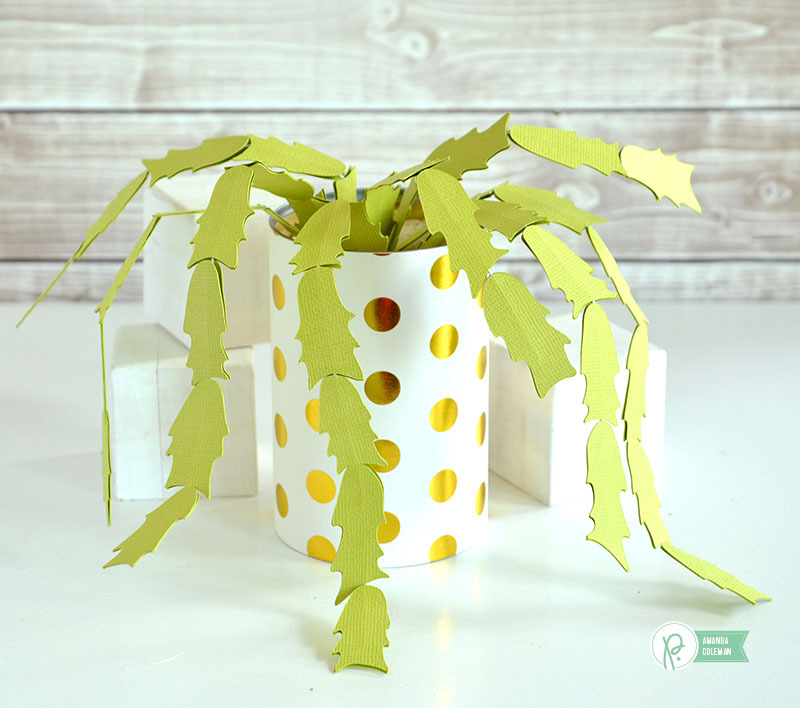 I added a couple of Washi Tape Strips to my page. 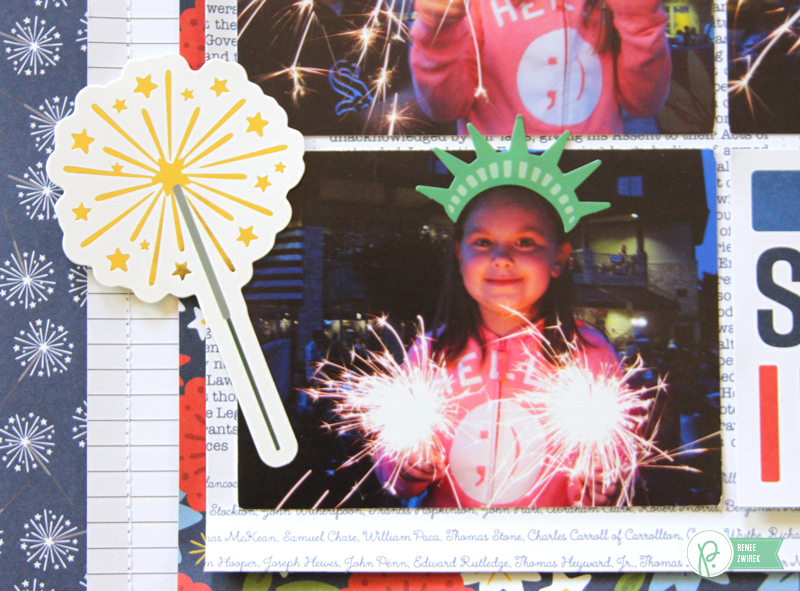 I love the Statue of Liberty crown sticker I added to one of Payton’s photos. I sprinkled Golden Color Mist around my page. 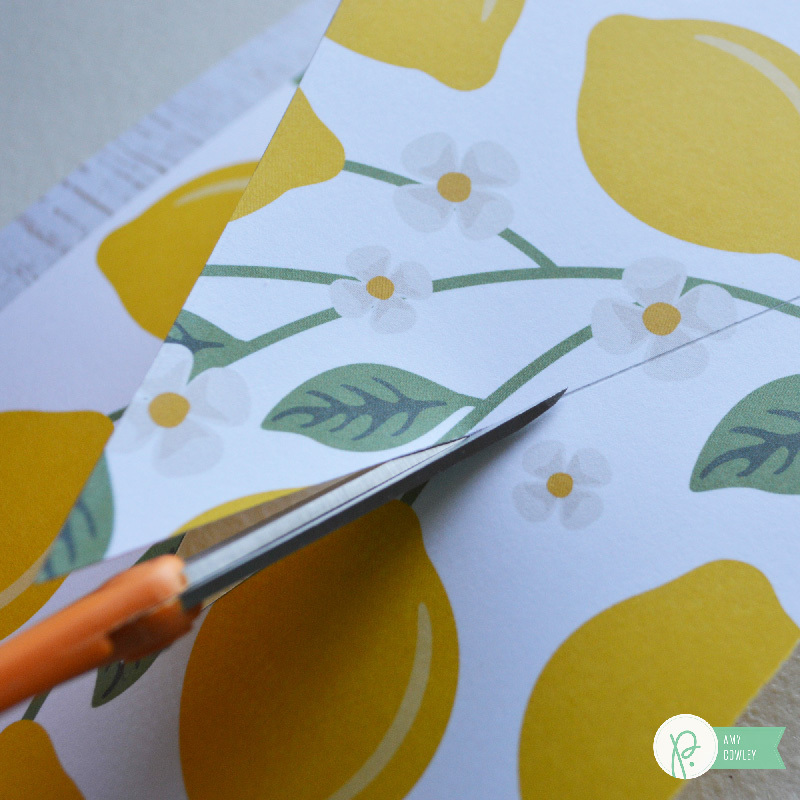 I added fun Stickers and cute Die-Cuts along with some hand-written journaling. The fireworks Stickers are fun and I love the movement they create. I normally don’t like my handwriting, but from time to time I think it’s important to add it to my pages for my girls to remember my writing. 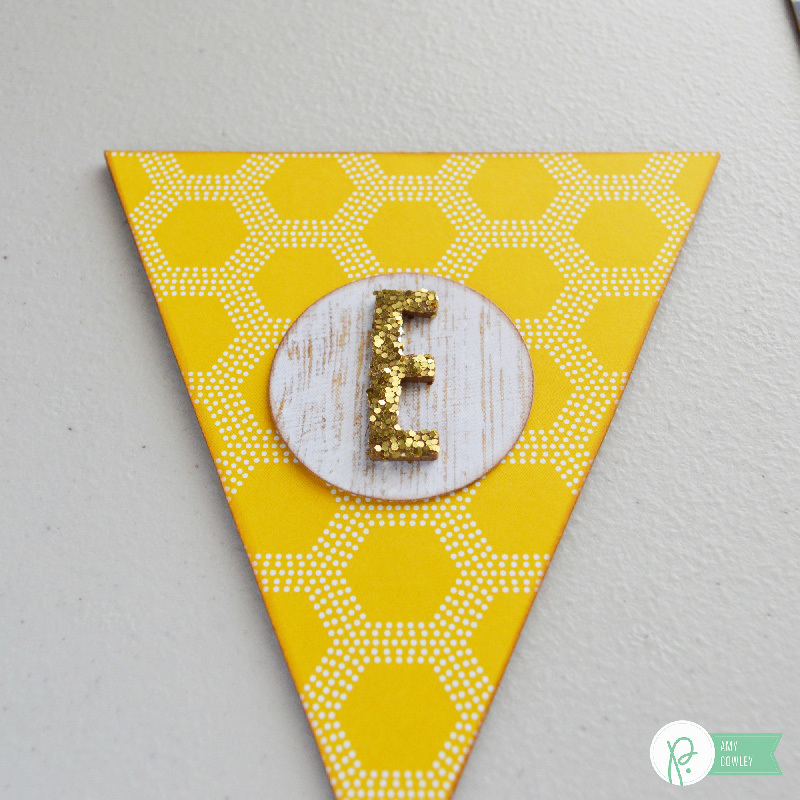 This sparkler Die-Cut is perfect! 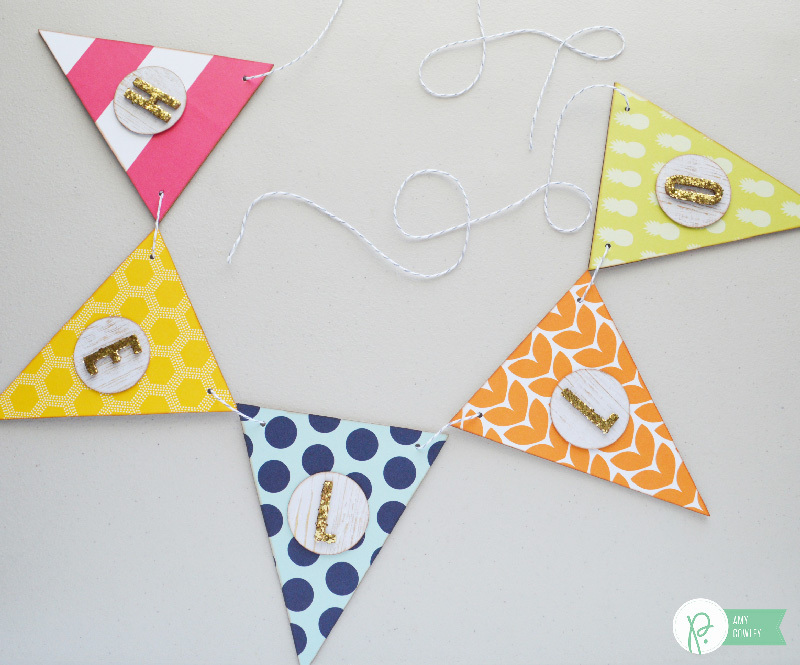 I love this group of embellishments. I added a toothpick to the pinwheel Sticker. I hope you enjoyed my Oh My Stars layout. 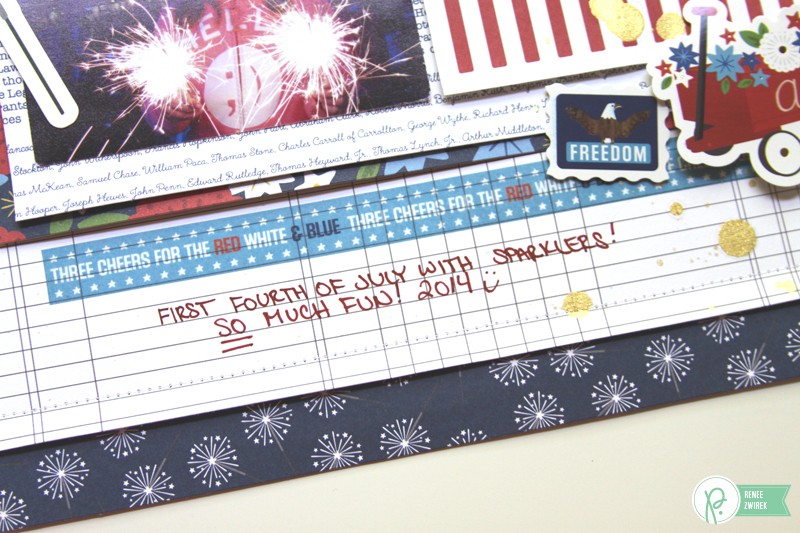 For more inspiration on scrapbooking your favorite 4th of July memories, check out my Double-Page layout here. Hey there, Amy from The Happy Scraps here today. 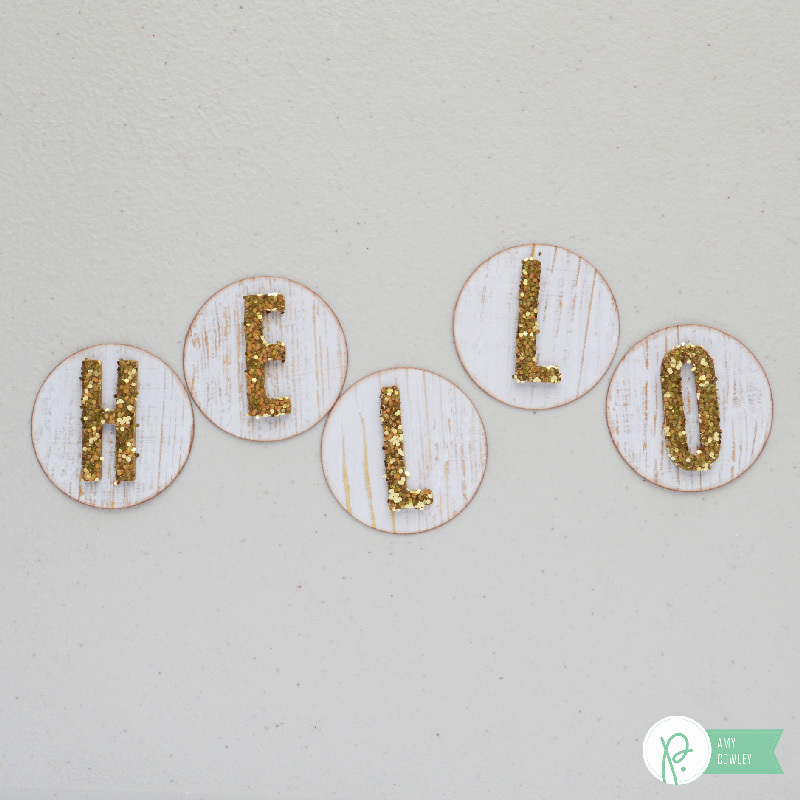 I’m excited to share this Simple Hello Banner with you today. 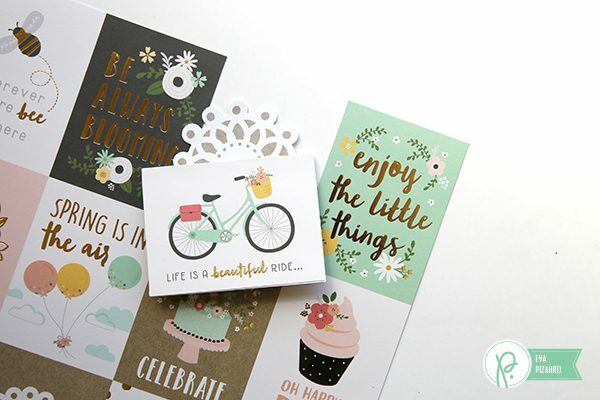 I really love all the fun papers in the Jen Hadfield Everyday Collection. 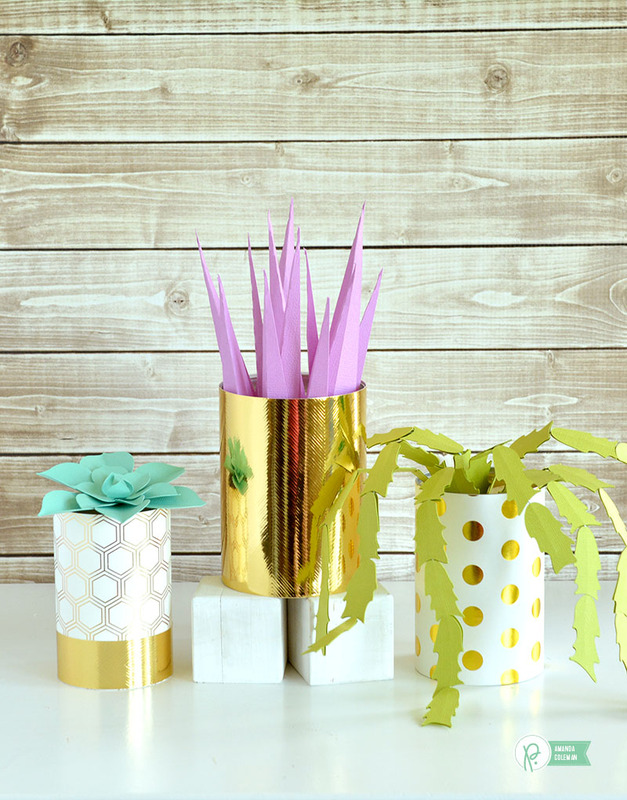 The bright colors and patterns are so fun! I picked out a few of my favorites to make this banner with. 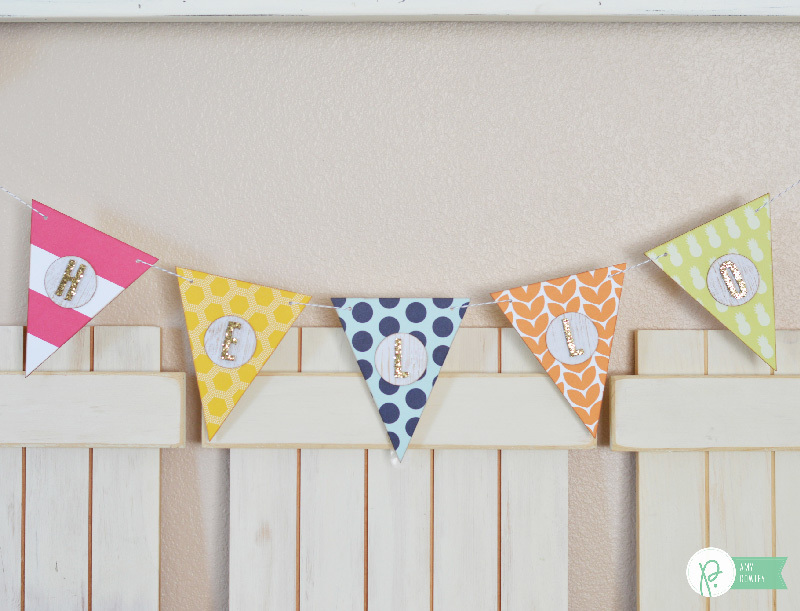 Banners are one of my favorite things to make. 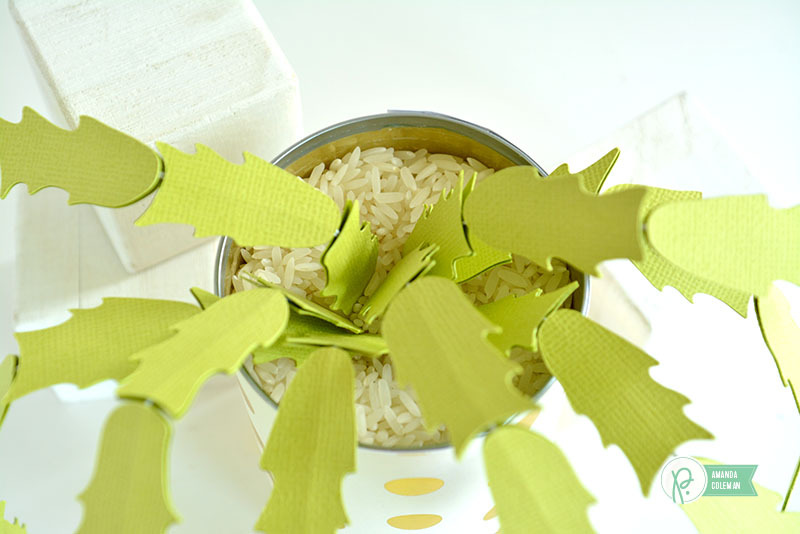 They are great for making a statement piece, and they are so customizable. 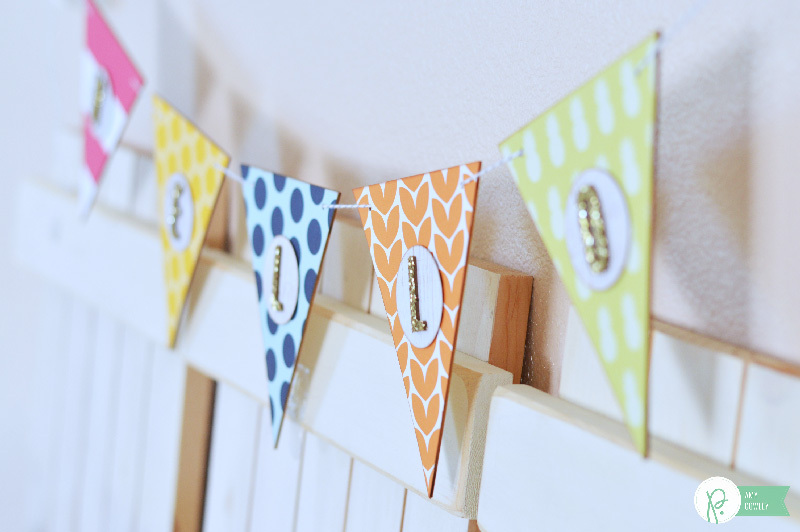 For this banner I grabbed five of the papers I really like in the Everyday Collection, the gold glittered thickers, and the wood banner pieces. I started by tracing my banner pieces onto the back of the paper I wanted to use. 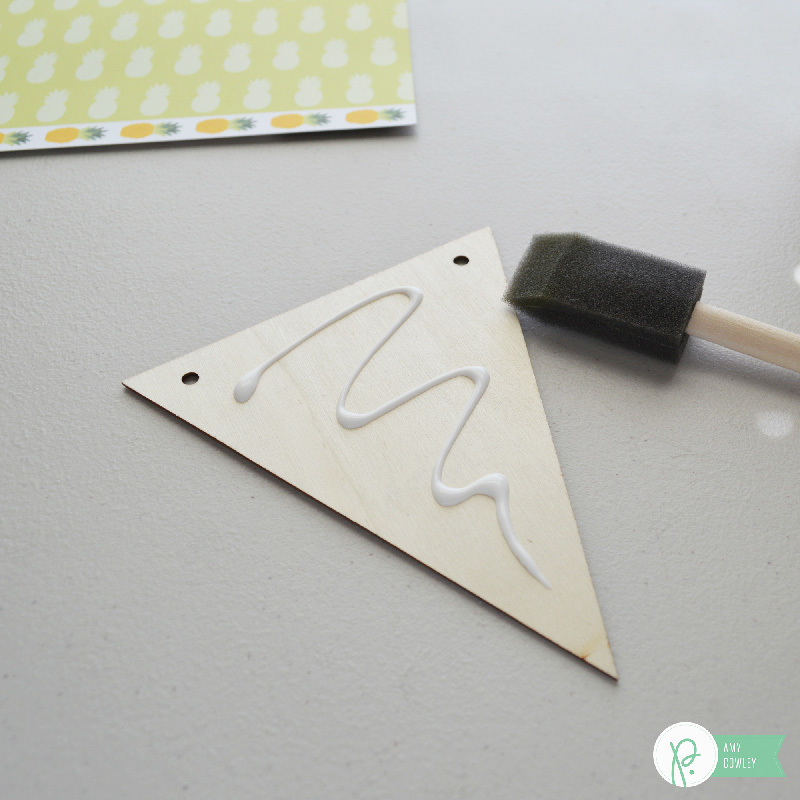 Using some wood glue, I put some on, then spread it out over the entire wood banner piece. I placed my paper over the glue and smooth it out good to make sure it was on there well. Once I had all the banner pieces put together, I punched out some circles. I inked the edges of all the banner pieces and the circles with brown ink. Next I placed the letters on the center of the circles. I placed a foam 3-dimensional tab on the back of the circles. Then I mounted them on the banner pieces. 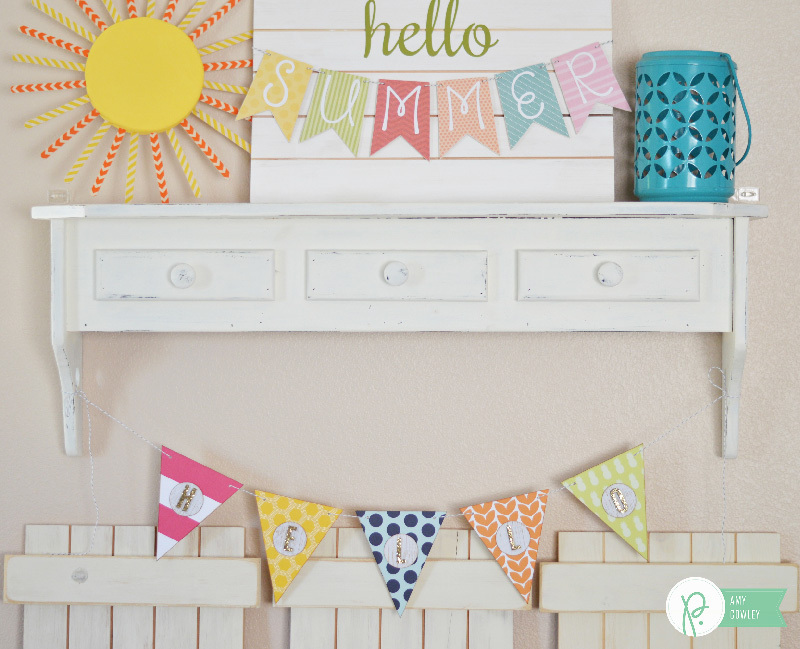 I punch out the holes and used some baker’s twine to string them together, creating the simple hello banner. I put it up with my other summer decor, and I think it’s a perfect addition! What do you think? Aren’t the bright colors SO fun?! 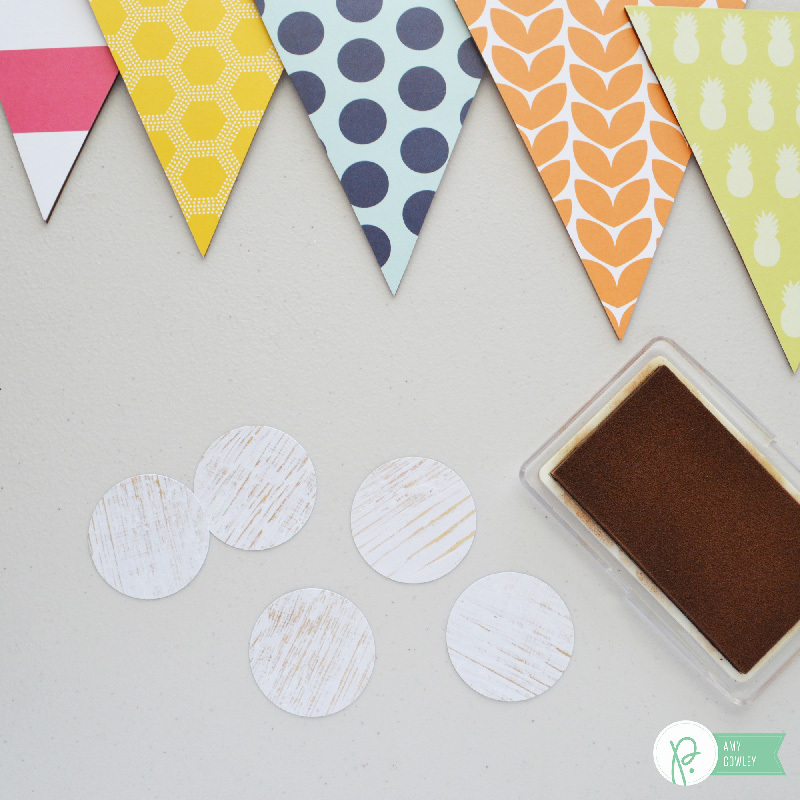 Grab some supplies and make yourself a simple hello banner. Hello everyone and welcome to the Pebble’s blog! 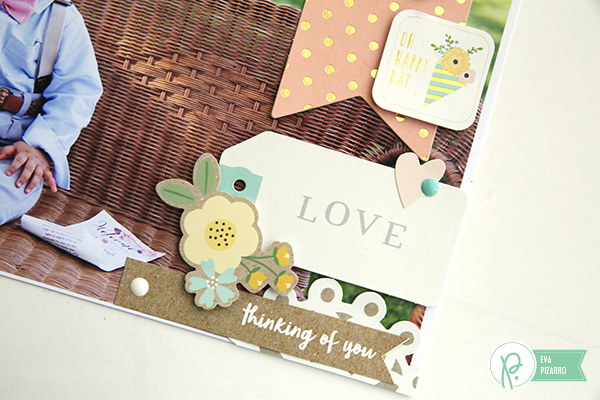 I am Eva Pizarro showing you a layout with a big photo and the lovely Spring Fling collection. This line is perfect for weddings, showers and celebrations. 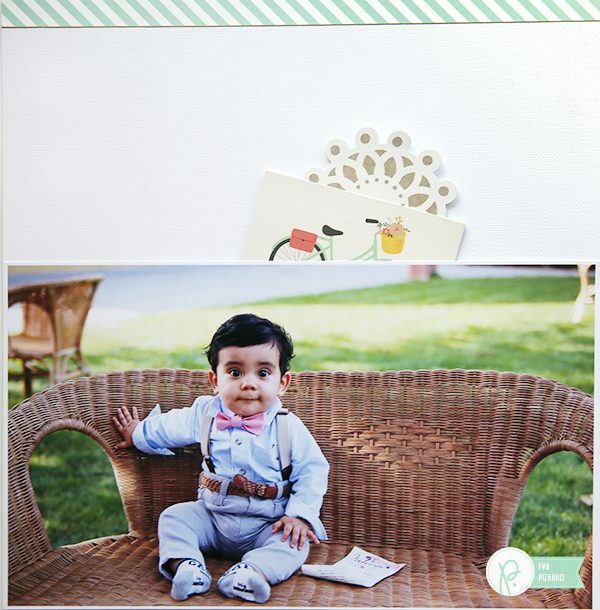 It has a mix of pink and mint that matched perfectly with the photo of my son at my sister in law’s wedding. 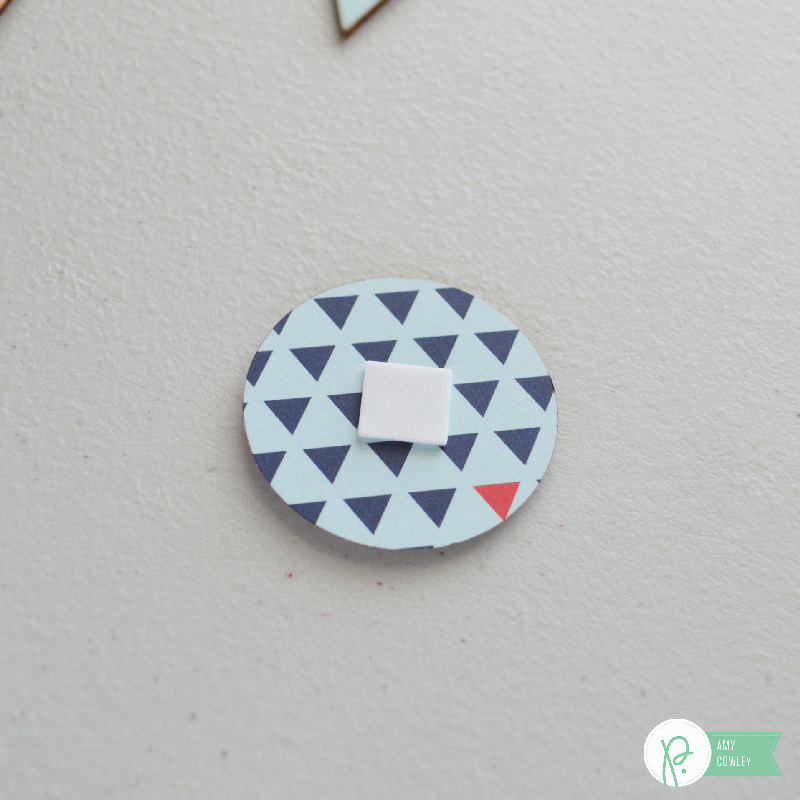 I wanted to create a small hidden letter for my son and the little 3×4 inch cards were perfect to create a card! 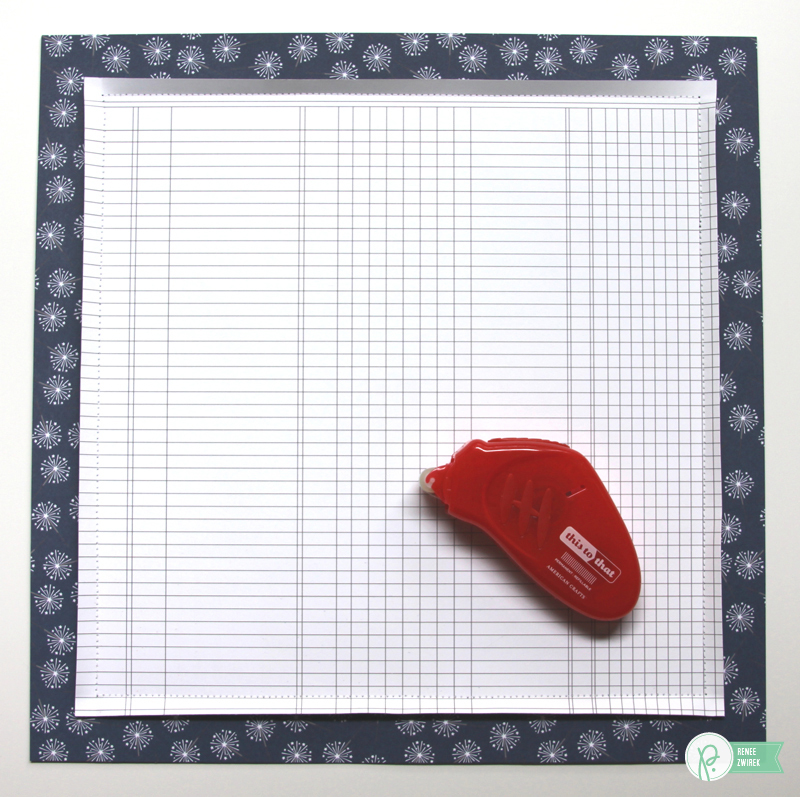 I attach a small piece of doily to access the letter easily. 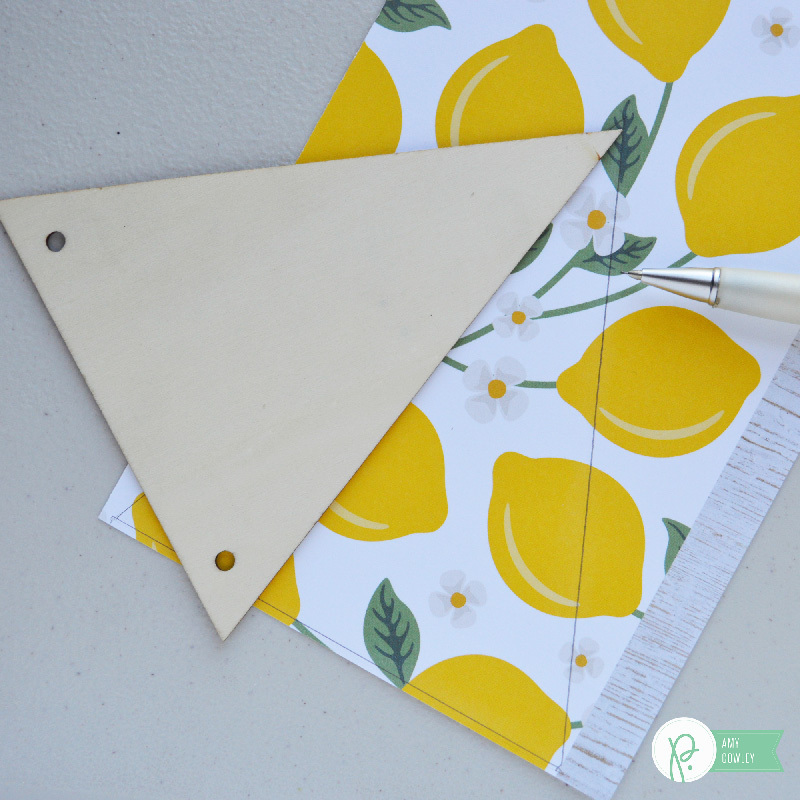 Hide the letter under your picture placing the doily where you want. Because I am using a big photo there isn’t much need of embellishments. I kept my title and all my design on the right side of the layout. 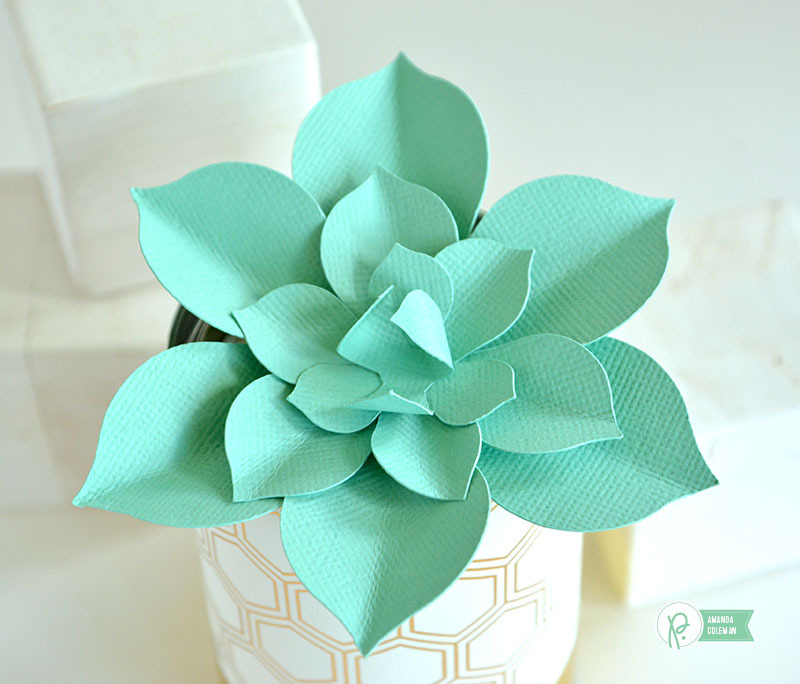 I added my title first and then big embellishments like doilies, a banner and a paper rosette. And I finish everything with some enamel dots and a few designs that I hand cut from patterned papers. The doily that is holding my letter isn’t attached to the layout but I placed a foam thicker on top so I can take it off easily. 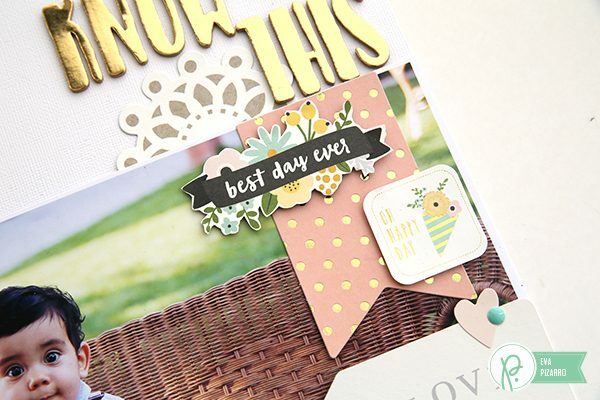 I love all the little embellishments in this collection. 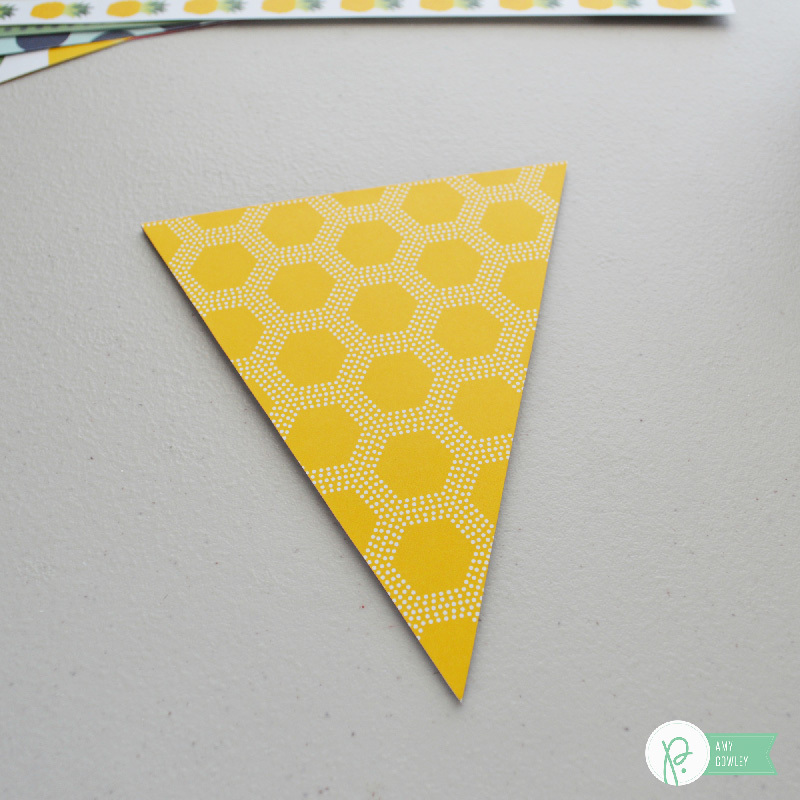 They are perfect for a baby layout! What do you think? Do you make scrapbooks of events like this? If you do I am sure you are going to love this collection! 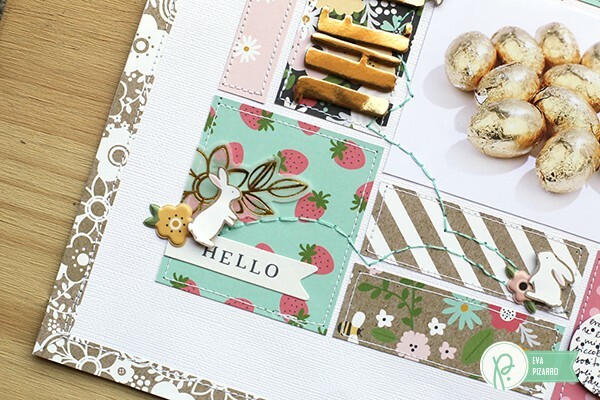 I use it for an Easter layout too! You can see the tutorial here!